Earlier this summer I mentioned that I would be watching the Loving God with All Your Mind DVD with some friends. This DVD set was released in June but my friends and I had opted to go through the DVD devotional series in July/August. We did a haphazard job together. I ended up watching this DVD set, released by Harvest House Publishers, by myself this fall. I do like sharing Elizabeth George with others but I think, in the end, I got more out of it but spending time with it alone. I read numerous (i.e., every title released) books by Elizabeth George when I was a teen. She was an author who just spoke to my heart and encouraged me to grow in the faith. Therefore I have very fond memories of her and was excited to see what this DVD was like. I'd never heard her speak before and, admittedly, she has a unique style. (She says "thank you, thank you..." to her audience a lot at the conclusion of each message which I thought was kinda overdone after awhile.) Just as I suspected though, George is gracious and sweet. The point of the overall message is how she focused on and memorized certain scriptures to grasp hold of particular Biblical truths. She presents her information in a straight-forward and even rather humorous manner. (She knows how to make fun of herself.) She sympathizes with struggles, and yet paints a "no bones about it" picture of what is expected of a Christian woman who is living out her faith. After watching the six sessions I felt like I walked away refreshed, re-motivated and challenged to focus on what is true, right and factual. I was encouraged to set aside certain things in the past and press onward. I felt like I wasn't to live a "name it and claim it" lifestyle, but rather was to graciously and humbly accept the things that God has brought into my life to refine me - and to be grateful. This DVD series felt like solid, Biblical exhortation. But it did take some time to work into it, as the first lesson is kind of more of an introduction while the latter five sessions get right to the point. 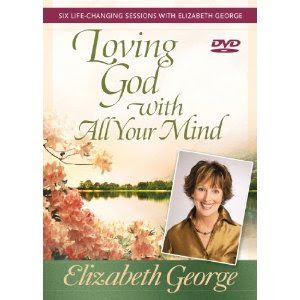 I would have to recommend the Loving God with All Your Mind DVD series. It may be hard to commit to meeting up with friends for six weeks running, but however you managed to get to the series, I think it offers practical advice and application. I really valued the time I spent with it. Thank you, Harvest House, for allowing me the opportunity to preview this new release. I sure appreciate it! I've read a few of her books but I can't remember if that title was one. Sounds like a good series! I attended a conference last fall where she spoke on session. I'd love to see the dvds. I think I need to pull out my EG books again! Thanks for the reminder!